Eric Rosenthal, an AUG member, is participating in this special community event next Thursday, March 12th. 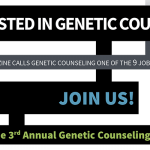 AUG members, genetic counselors, family, and friends are welcome and encouraged to attend, ask questions, and provide support! Arguably one of the most significant scientific discoveries of the past century, the mapping of the human genome raises almost as many questions as it answers. These are questions that will profoundly impact the way we think about our health, about disease and about free will. This special hand-selected panel of scientists will offer insight into the what, why, and how of genetics.